Opossums are omnivores and they can eat almost anything, and the trash can prove to be a place that they will truly thrive. The opossum can tip the trash cans and then spread the trash all around as they scavenge for food. In general, they are quite harmless and when they feel threatened, they just play dead. However, it is always a good idea to keep the animals away from trash by all means possible. Metal trash can: you may do yourself a lot of good if you are able to buy yourself a trash can that is made of metal. The metal trash cans that are heavy are less likely to be set apart by the opossum or even tipped over. Ammonia: this can also help at times. You can pour some ammonia into a can and then place it at the very bottom of your trash or somewhere near the trash. Opossums don’t like the ammonia smell and they may be repelled. Double bag: you can also choose to double bag the trash just before you put it into the can. This limits the smell that comes from the food remains. It is the food that attracts the opossums in the first place. 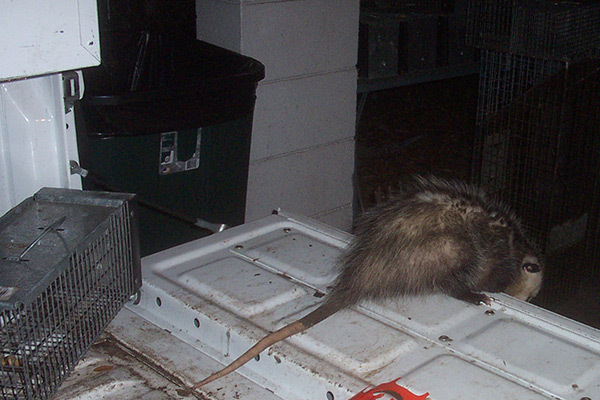 Tie the lid down: this can help as the opossum may not be able to gain entry into your trash. You can use a bungee chord and then place a cinderblock at the very top of the lid. Food sources: the other amazing thing that you can do is to make sure that all the food sources are carefully and skillfully eliminated. The trash may not be the only part of your yard attracting the animals. Clean up the yard of any fallen fruits, and make sure that pet food and bird feeders are locked in at night. Shelters: you also need to make sure that the shelters are eliminated. Opossums get comfort within a home because of all the areas that can be used for hiding purposes. Eliminate the shelters and encourage the opossum to move out. Traps: if the issues still remain, use traps around the trash area. Opossums are naturally attracted to garbage cans as they see it as an easy food source. However, if you make it difficult for them by using the tips outlined above, they will move along to food that is more accessible.